Husqvarna Battery Box – the world’s first connected garden toolshed - enables home owners easy access to high performing battery powered products for the garden. Telenor Connexion is providing a cloud solution and its ecosystem of partners including Flex, HiQ and Zuora. The Husqvarna Battery Box, is a "smart" unattended container with 30 electronic lockers that store battery powered garden care products available for rent via an app. Husqvarna Battery Box – the world’s first connected garden toolshed – enables home owners easy access to high performing battery powered products for the garden. Internet of Things and the sharing economy is changing the world at a rapid pace creating new exciting opportunities for companies to explore new business models and new technology solutions while contributing to a more sustainable society. The Husqvarna Battery Box brings together the concepts of environmental awareness and the sharing econonomy and is a part of Husqvarna’s commitment to explore innovative and sustainable solutions for taking care of gardens and green spaces. Starting this May, homeowners in Stockholm can access pay-per-use power tools for the garden, eliminating the need to maintain and store hedge trimmers, chainsaws and other tools that are used less frequently. “People are already sharing homes and cars. To share products that are only used occasionally, like a hedge-trimmer, makes a lot of sense for some users. Husqvarna Battery Box is proof of our commitment to explore new solutions that merge innovation and sustainability, benefitting the homeowner, the community and our distribution network,” said Pavel Hajman, President of the Husqvarna division. 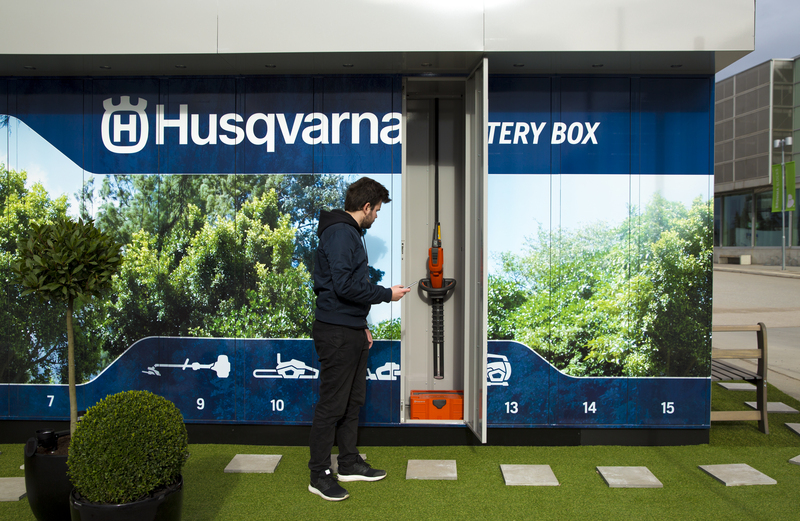 The Husqvarna Battery Box, is a “smart”, 8×3 meter, unattended container with 30 electronic lockers that store battery powered garden care products. Via an iPhone app, homeowners can reserve tools, get instructions, pay, and open the locker to pick up their pre-booked power tool. The “box” will be placed at Bromma Blocks, a shopping center 15 min west of Stockholm city. Renting a garden care product will cost 350 SEK a day (approx 35 Euros or 38 USD). Husqvarna Battery Box is the result of a partner ecosystem where Telenor Connexion provides the communication and cloud solution bringing on board its partners Flex, Zuora and HiQ. Flex builds the connected box and reports its status on events handled through the cloud solution with Telenor Connexion. Zuora supplies the subscription payment solution and HiQ builds the app and the system needed to bring everything together. The shopping center Bromma Blocks provides the space for the test. “We are delighted to be part of this innovative and exciting project. For Telenor Connexion the Husqvarna Battery Box is a perfect project to apply our partner ecosystem catered for businesses that want to take on the digital transformation journey. This demonstrates our strenght as an enabler of a true end-to-end solution including everything from security to hardware and direct payment from end customers”, said Mats Lundquist, CEO of Telenor Connexion. This pilot project supports Husqvarna’s sustainability agenda to drive the conversion from petrol powered products to silent battery products with no direct emissions in urban areas. Additionally, the purpose is also to test the real-world applications of this technical solution, as well as collect insights on market maturity, customer behaviour, and potential future revenue streams for Husqvarna’s distribution network. The test period runs from May 1 to October 31, 2017.